It couldn’t be simpler! Say you get an e-mail that reminds you that you still haven’t done this or that for someone – you no longer need to enter a hand-typed ToDo in Basecamp! 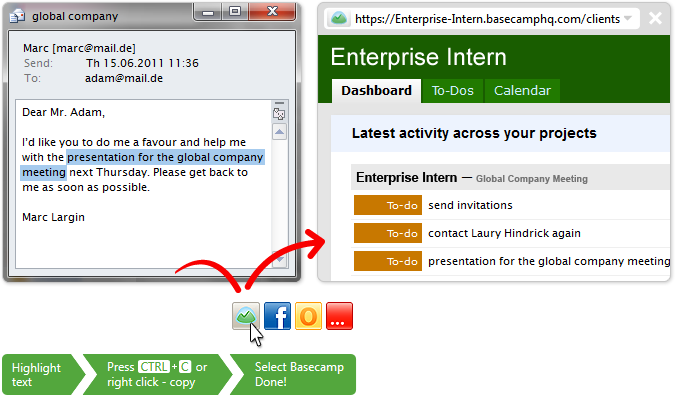 Instead, you copy the to-do text, press CTRL + C or right click -> copy, and click the Basecamp icon that appars over your mouse pointer. Click.to automatically creates a Basecamp and adds it to your account. If you want it to, Click.to will even store your login information locally on your computer (encrypted) and log in automatically for you – all with just one click!